Why is Beetroot good for you? Beetroot (also commonly known as beets) is rich in Betaine and contains the antioxidant alpha lipoic acid (ALA). Involved in cardiovascular function by reducing homocysteine. Beetroot have been cultivated for thousands of years for their dietary value. Recent studies have indicated that consuming beetroot juice can improve certain health conditions and can also improve oxygenation during athletic activities. Though the full health effects of beetroot are not yet known, many health experts recommend consuming beetroot or beetroot herbal for a nutritional boost. Betaine (Trimethylglycine) is found concentrated in beetroot. Dutch researchers assessed the impact of different amounts of betaine supplementation on homocysteine levels. The randomized clinical trial involved 76 patients that were split into 4 groups (1 placebo group and 3 experimental arms supplementing with 1.5, 3, and 6 grams betaine). The homocysteine biomarker was tested at a 2 week and 6 week checkpoints. The researchers demonstrated that all strengths of betaine significantly reduced homocysteine levels by 12-20% in both the second and sixth week of biomarker testing. Thus, implementing beetroot extract betaine may be beneficial in lowering elevated homocysteine, a toxic and inflammatory compound in the blood. In addition to this study, there are published, peer-reviewed publications that demonstrate betaine to be an antioxidant, which would be protective nutrient for metabolically active cells including the liver hepatocytes and heart cardiomyocyites. 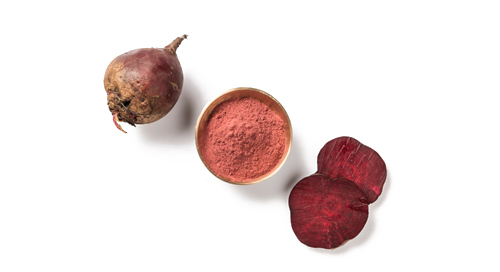 Setu Beetroot is extracted from red beetroot (Beta vulgaris), a chosen root for its beneficial qualities including betalins and betaine.